Jeff is a prominent cellist….and a prominent teacher…..and one of the most passionate searchers for sound I have ever met. Its a compelling challenge to work on all of his fine, varied cellos that range from old to new….big/dark to smaller/brighter. Add this all the stressful variations that seasons, travel and wear and tear provide and its a delicate balancing act. Some demand work inside work ( i e bass bar etc) …or work from the outside ( bridge,post etc) …neck angle adjustments….truly the whole spectrum of ways to enhance the sound and get every ounce of punch and depth that each instrument has to give. 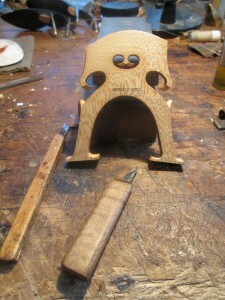 The bridge pictured was cut for a fine Sgarabotto cello that he was using to play the Bach suites at Bargemusic in NY. 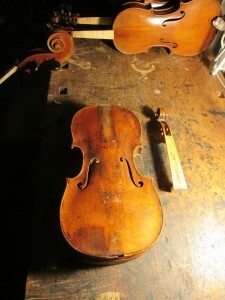 Here are 2 beautiful Italian violas that figure prominently in the Philadelphia Orchestra. These instruments are played by very sensitive,fussy players who know immediately when they have lost power and clarity due to openings. Changes in climate/humidity/ locale all conspire to expand and contract the top & back plates…..which in combination with the glue being made to let go if need be to relieve dangerous stress…is a recipe for needing to find and glue often small subtle openings. This is even more difficult on older instruments. I’ve developed a number of subtle methods to find the subtle openings ….the large ones are easy to find….but with these players the openings never get very large because they have me checking/gluing at the slightest variation in sound. Many problems with instruments are often thought to be more dramatic in nature….but really are solved by a very thorough search and careful gluing. After 5 plus years I still have so many vivid Moennig era memories….One that struck me recently was a day that the great Japanese violinist Mr Toshiya Eto came to the shop. Mr Eto had been at Curtis in the late 1940’s early 1950’s and had developed a long standing friendship with Bill – and had a number of fine instruments from the shop over the years…and his students would come as well. On this particular day he had a very fine Pressenda that needed attention….among other things it needed to have the fingerboard planed rather dramatically. I started in on it by carefully taking down the set up/ bridge etc. 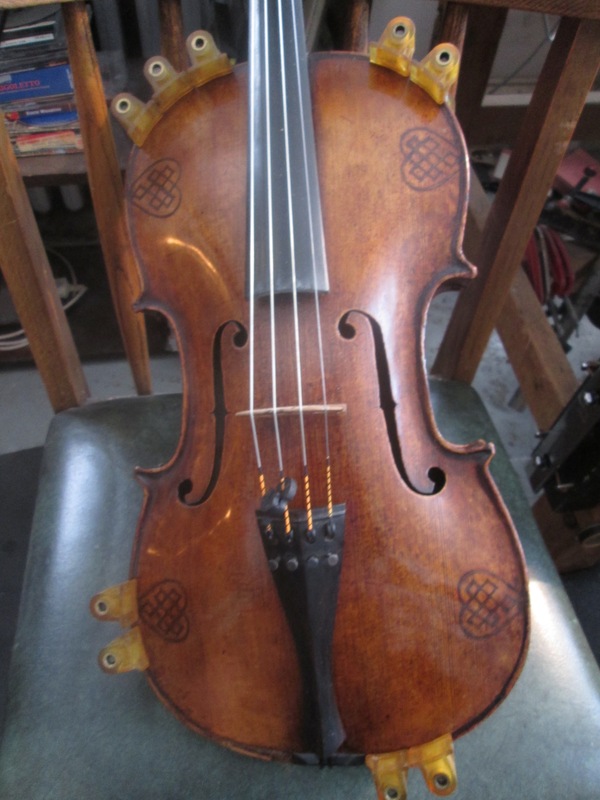 ( This was something you got very careful about at the shop – you were always working on great instruments for great players …so you always had to be able to re-set up the instrument very,very accurately …..(both bridge placement and most importantly post position. I was always making markers to guide me.) Theses were players who had played these instruments for many years at the highest level… so there was no margin for any error or change. The first thing to do was to sharpen my plane blade…if Bill would be walking behind you….and he heard the loud scraping sound of a dull plane blade he would tell you bluntly. Once I got started to plane the fingerboard I realized that Bill and Mr Eto were going to stand right behind me while I worked! Needless to say it was a stressful hour…trying to be as surgical, effecient and accurate as possible…while Bill and Mr Eto chatted amiably…..all the while watching every move I made. I know of no more delicate scenario than working on a fine instrument in front of a fine player….and getting it done well …and gracefully. Another interesting thing about Mr Eto was that he was the first child pupil of the legendary Mr Suzuki….apparently the father of Mr Eto approached Mr Suzuki to teach his 4 year old son ….and a movement that swept the world was born. I found this instrument laying dormant for, no doubt, generations. 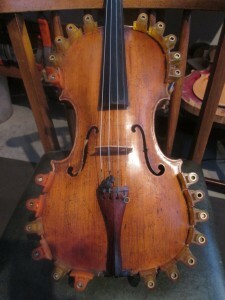 It still had its original neck set… which by modern standards is too short and too low. Its interesting to think that the whole concept of the neck angle has changed towards more tension … thereby producing more power. It also coincides with the rising of the concert A through time up to 440. In order to bring this instrument up to modern standards the top block needed to be replaced (more beefy) and a foot and a heel need to be added to the neck stock. Its then set into the new block. Another thing that needs to be done is the fitting of a new stouter bass bar inside to handle the load of the greater string tension.